Situated 9 Miles from Worcester and 6 Miles from Evesham it can be reached via the B4084 road. This small town of about 8000 population has been known in ancient times as “Persere”* and “ Pearsore”. Set on the banks of the river Avon it offers much for the visitor. Pershore is known for its Georgian architecture and interesting to note that most of the premises in Bridge Street and Broad Street are listed buildings. Besides its past and present connection with market gardening and growing of many varieties of plums it once had an important connection with the wool trade by way of sorting and grading. There are a wide variety of shops offering a range of goods from gifts and souvenirs to domestic provisions with many offering local produce. With its many eating places, Hotels, Pubs, Cafes, and Take-Aways there is ample provision for the visitor. Nearby Bredon Hill at nearly 1000ft high is the largest outlying hill of the Cotswolds, one of the 176 classified Marilyns in England. A folly in the form of a tower sits on the summit and is called Parsons Folly. Bredon Hill at 299 metres high has no other hills in its way or that are higher, if you go due east, until you reach the Ural Mountains in Russia. As in ancient times an important place to visit is Pershore Abbey, and is believed to have been founded by Ethelbert , King of Mercia , in AD689. A historical notice of the founding of the abbey is to be found in Leyland’s “Collectanea” in which reference is made to Abbess Hilda‘s death in AD680. It was in those days that the monasteries of Pershore and Gloucester were founded by Oswald and Ostric. Oswald founding Pershore , Gloucester being founded by Ostric. It was in 976 that it was destroyed by Aelhire and was restored by Ethewald and Wada and Oddo in 983. Oddo brought the relics of St.Edburga from Winchester to Pershore and although at the time the church was dedicated to St. Mary, St.Peter and Paul ,Edburga and the Holy Cross it eventually became just The Holy Cross but this just applied to the nave. It is believed to have become Benedictine in 984. Much of the structures were destroyed by fire and storms during the 13th century and no records exist of the conventual buildings. At the time of the abolition of the monastries the parishioners bought the church for £400 . The Abbey is now much reduced to from its original size (once in excess of Worcester Cathedral), it is however still a formidable and attractive building with beautiful stained glass and memorials which include a war memorial to those killed in two world wars. The font is believed to be Norman and is decorated with carvings. Outside buttresses added to the main structure now give support to the building and were added in 1913. In 1996/97 when a new floor was being laid, Saxon foundations were found. Many events take place in the abbey besides worship. 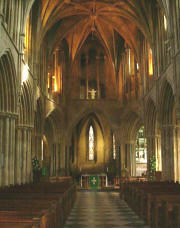 Recitals and concerts are held regularly, it is possible to see a list of these displayed in the abbey. 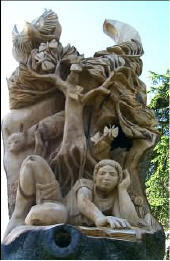 Whilst visiting it is worth taking a short walk in the abbey park, here the stump of a tree has been carved, it is truly a work of art which was completed by the sculptor Tom Harvey. Pershore was once two parishes , The Holy Cross and St. Andrew’s the parishes only being divided by the width of a road , now day’s the parishes have been unified into The Holy Cross. The church of St Andrew is now redundant but is now a visitor’s centre and during the summer months serves teas. The indoor retail market is signed off the High Street, established in 1976,it is a popular amenity, visitors from far and wide take advantage of the opportunity to browse through the 34 stalls which range from food to clothes to gifts and household items, it is open on Wednesdays, Thursdays, Friday’s and Saturday’s 9am to 5pm. The Community Arts Centre - named No. 8 is situated in the High Street and is close to the junction of Broad Street. It was inspired by the local community, founded by the local community and is now supported by them. It offers the opportunity for visitors to enjoy a diverse arts experience; its friendly atmosphere has attracted many to enjoy the facilities that include a cinema screening mainstream, art house & children’s films as well as being a live events venue programming opera, theatre, music and dance. There is also the chance to see a continuous programme of art and craft exhibitions that are set within the coffee bar. Number 8 also serves Homemade cakes, tea and coffee, these are available Monday to Saturday 10am – 4pm. Pershore Leisure Centre was rebuilt in 2002 the centre is modern, bright and spacious, close to the town centre and to the Riverside Gardens it ideally situated for the visitor wishing to take advantage of its facilities. Comprising of a 25m Swimming Pool and a Fitness room that includes more than 30 items of Cardio-vascular resistance equipment. It also has a Health Suite – Sauna, Steam Room and Spa. As well as these a Dance Studio and a Sports Hall is on site. The Pershore Leisure Centre also manages the sports facilities at Pershore High School, these are available for hire, on offer is: 1 Astro – turf Pitches, 2 Grass Pitches, 4 Tennis & 3 Netball courts, 4 Court Sports Hall. The Riverside Gardens provide a picnic area with seating enabling visitors to enjoy a relaxed view of the River Avon with its river traffic consisting of boats and barges. Pershore Bridge is just a short distance along Bridge Street (B4084 ) towards Evesham; the historic bridge was the scene of skirmishes during the civil war and scars from this are to be seen in the stonework. 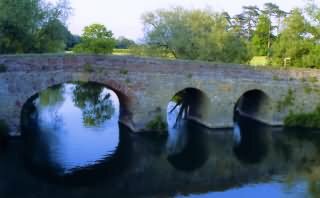 The bridge contains stone from the former castle at nearby Elmley Castle which was destroyed in the War of the Barons during the reign of Henry the III. A small car park and picnic site gives visitors the chance to stay a while. Pershore Horticultural College is found by continuing on the B4084 towards Evesham. Founded in 1974 its purpose was to train Horticulture workers, it rapidly gained international recognition and has attracted many overseas students. Since 1990 it has been connected to the Royal Horticultural Society (R.H.S) and has featured in its annual shows. The Campus is situated on a site of 60 hectares and provides unrivalled resources for students. With its Gardens and conservation areas occupying 15 hectares and hard-landscape workshop and studios, crop production facilities include a further 12 hectares of fruit and computer controlled glasshouses plus a nursery and a specialist plant unit, it is not surprising that its high reputation is spreading internationally. On the 1st of August 2007 the college merged with the Warwickshire College. For the visitor there are regular open days and events, for information about this Telephone 01386 552443. The Real Flower Petal Confetti Company can be found by continuing along the B4084 towards Evesham in the small village of Wick, it is here that this company is based. Natural confetti is produced from the petals of delphinium flowers. The flowers are grown and harvested by hand on the farm at Wick, no artificial drying or colouring is used in the preparation and allows them to biodegrade naturally as blossom. The flowers are usually in bloom at the end of June or early July depending on the amount of sunshine in the preceding months and should last until the early part of August. Visitors are of course welcome, but it must be stressed that the company cannot offer the facilities that one might expect at a tourist site as it is still a working arable farm that happens to grow beautiful fields of flowers. It is possible to view the fields and to purchase packs of confetti. The idea of producing confetti was conceived by the owner Charles Hudson, he was on his way home on a late spring afternoon when he paused outside the local church yard. Strewn around the lych-gate was a sodden mass of coloured paper these being the remains of paper confetti, this had turned the church entrance into an eyesore. Upon his arrival home Charles , who was carrying a bouquet of flowers for his wife, was inspired when a petal fell from the bouquet , for it was then that the idea for petal confetti was born. He experimented with many flowers following this incident and eventually found that delphiniums were the most natural in their ability to retain shape and colour by using the sunshine and fresh air in a system that he had evolved. New varieties have been produced using wild flower colour essences for subtle colour mixes to match any brides wedding dress. Charles Hudson’s Wyke Manor estate is now the British centre for real flower confetti and every year he plants an original design in a 10 acre field, his 2004 Delphinium Union Jack was filmed from the air by national press and TV. It was visited by the Guinness Book of records and the flower flag is in the record book for posterity. The confetti was the choice of Madonna , Catherine Zeta Jones and Gabby Logan at their weddings. Croome Park, Ragley Hall, Coughton Court, Hanbury Hall, Snowshill Manor, Broadway TowerBroadway Village, Stanton Village, Malvern Hills, Stratford on Avon, Spetchley Park Gardens, Stanway House and Fountain and Worcester Cathedral. Paul Bordiss - Studio and Gallery, The Court Yard, 19 High Street, Pershore, Worcestershire, WR10 1AA. 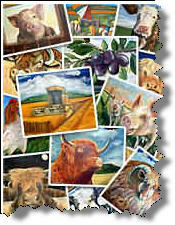 "Art to make you smile" see Paul Bordiss - further information. 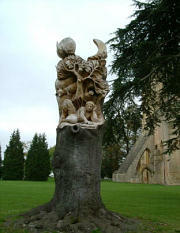 Tom Harvey - Sculptor - Tree Sculpture in Pershore Abbey grounds. See Tom Harvey - further information. 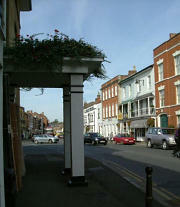 Toyah Wilcox - pop singer and actress lives on Bridge Street, Pershore. She has had 8 top 40 singles released over 20 albums.